Jean-Pierre Hadida is a French artist born in 1960 in Oran. Painter, writer and music composer, he joined the underground rock band “Salamangé”, from 1976 to 1979. 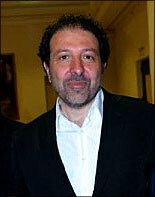 In 1982, after international business studies, he was hired by Publicis advertising adgency in Paris, as a copy writer. Jean Feldman taught him the art of communication. He produced more than fifty radio programs, known as “Cocktail”, in the mid 80′s, working with famous artists such as Serge Gainsbourg. He started his own agency as a creative director (Venise), working in Paris, Sao Paulo, New York, Miami, Houston, Madrid and London. He co-designed posters for Musée du Louvre (2000), Cannes film festival (2007), Dior, Cartier (2008) and Mercedes (2009). He also composed music for films and a musical, “Anne the musical”, based on the true story of Anne Frank (Théâtre du Gymnase, Espace Pierre Cardin 2011-Paris). Jean-Pierre Hadida uses a wide variety of methods for expressing his visual art : Finger tag art on Apple I-pad, Acrylic on canvas, digital animation, or sculpture. Influenced by Ben, Keith Haring, Jean-Michel Basquiat and Andy Warhol, he is inspired by bright colors , cartoonists, rock ‘n roll, and big cities. He likes to be called a pop artist… He lives in Paris. Copyright © 2019 - Hadida Art - All rights reserved.